Most people drink diet soda because they want to cut down on calories. Others may like the less sugary taste of a diet drink. Seems to make sense, but what they don't know is that drinking diet soda can lead to not only tooth damage but diabetes, heart attacks, strokes and even depression. Here are some facts to consider before picking up that next can of diet soda. One study found that people who drink just one diet soda a day can increase their risk of a heart attack or stroke by 43 percent. This risk was not found among people who drink regular soda. A University of Minnesota study showed that people who drink one diet soda a day also increase their risk of getting Type 2 diabetes by 36 percent. It also increases metabolic syndrome. Metabolic syndrome is not a disease in itself but a group of risk factors such as high blood pressure, high blood sugar, unhealthy cholesterol levels, and abdominal fat that can increase the risk for heart disease, stroke, and diabetes. People who drink four cans of soda a day increase their risk for developing depression, according to a 10-year at the American Academy of Neurology. Both diet and regular soda drinkers are vulnerable, although the risk appears to be higher among diet soda drinkers. You might think that drinking diet soda is better for your teeth than regular soda. Wrong. It's the citric acid in diet soda that damages the teeth. Citric acid causes tooth erosion which in time will wear away tooth enamel and destroy the teeth. 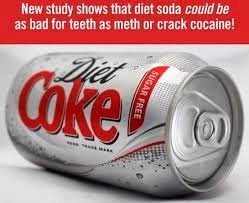 In fact, one research study found that tooth erosion among diet soda drinkers was the same as what you would find among cocaine and methamphetamine users.